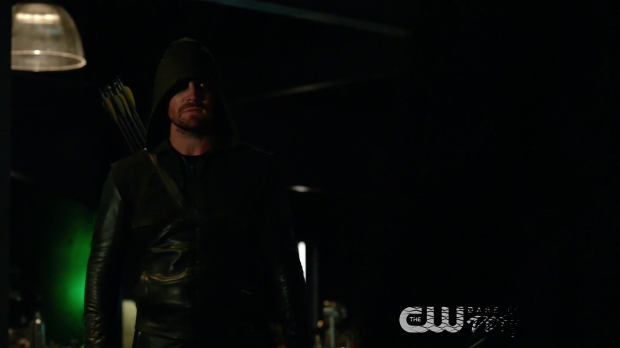 Arrow tightly focuses on Oliver Queen as he processes Diggle’s decision to leave him and consider what his next move should be. This season has been rough on Oliver Queen. Half of the team left then Thea decided to go her own way and Diggle decided that working for Oliver is no longer for him in last week’s episode. All of this amounts to Oliver losing things that he holds dear despite repeated observations from others that he has become a much better person since he started his mission. There are a few ways of looking at why Oliver’s life seems to be falling apart with much of it being attributed to the way Oliver is. Diggle left because he feels that Oliver’s leadership is lacking now that he’s living a triple life as husband/father, Mayor and Green Arrow. It’s a lot for one person to deal with and there’s no shame in admitting that cracks are starting to show because of the strain he’s putting himself under. My personal opinion is that Oliver’s leadership isn’t the thing that’s lacking, it has more to do with how he goes about leading rather than how he does it. It may sound complicated but the distinction can easily be made by breaking it down into leading the team in the field and his leadership in-between missions. Oliver in the field is intelligent, has a great mind for strategy and knows how to make the best of the resources he has to hand. His plans are well thought out and everyone is used to good effect. When not in the field Oliver struggles to consider the feelings of those he works with and takes liberties with what is acceptable treatment. For example assuming it was his right to place them under surveillance is an example of arrogant presumption that lessens his effectiveness as a leader as it suggests that he has no confidence in those he commands meaning that they have no reason to have any confidence in him. Strangely the fact that Evelyn turned out to be a traitor never comes up as it would have supplied some justification but the fact remains that this behaviour was wrong and the others were right to go their own way. Thea’s reason for leaving has nothing to do with Oliver other than the general life he leads being a dangerous one that impacts on others. Diggle left because he had lost faith in Oliver’s leadership and saw the rest of the team leaving as being a direct result of that. In short Diggle can’t work with him because he no longer trusts Oliver’s judgement and that reason fuels Oliver’s arc in this episode. After such major events it’s the right time to reflect on those and when this show does that it usually dusts off the Vertigo drug to allow people to confront their inner selves in a more visual way. Oliver’s inner demons take the form of Adrian Chase for much of the episode which seems like a good choice at first until it is really considered. Adrian was a great villain in season 5 who challenged Oliver in really visceral ways and forced him to confront some uncomfortable truths that helped him understand who he was in ways that he didn’t before that point. In the case of this episode he represents the past that he has left behind and arguably grown beyond. In effect that past is haunting him and encouraging him to embrace it once again as the only way to move forward. With that focus Adrian is completely the wrong person to do that as he isn’t a natural link to that past in terms of reviving the season 1 version of Oliver as the episode is clearly trying to do. Someone like Tommy would have been a great ghost from the past to do that or if focusing on mistakes leading to loss was the aim then Samantha would have been another choice. I understand that some of this could be down to actor availability but choosing Adrian does feel very deliberate. This episode is a great actor showcase for Stephen Amell as he spends most of the episode playing off one other actor while portraying Oliver in a state of deep distress and confusion. Josh Segarra hasn’t missed a beat as the version of Adrian Chase living in Oliver’s subconscious. He’s just as magnetic and as menacing as ever. For this episode he feels a bit lacking in dimension but that makes complete sense as this manifestation has been conjured up by Oliver for a singular reason. “Adrian” takes him through his recent losses and frames them as being all his fault. Every word said by this manifestation hits hard because on some level Oliver believes it to be true which means he thinks that he’s a decent mayor but currently a bad hero who is unable to lead a team and sees some merit in Diggle’s accusation that he has been spreading himself too thin. None of this means that it’s necessarily true but the important thing for now is that Oliver is in an emotional headspace where he is willing to believe it and that’s what proves most dangerous. A mirror is held up to Oliver with all his deepest feelings laid bare. At this point self loathing, a lot of guilt and a fear of abandonment are experienced by him most significantly. Those emotions are complimentary as they feed into one another and escalate because of Oliver’s mental state at that point. Early in the episode he asks Quentin why people keep leaving him if he’s such a good person and it’s clear from this that being abandoned by his best friend in particular has cut him deep leaving him feeling that there is no real forward direction for him. Oliver’s major crisis is that he doesn’t know what to do next which is a relatively new experience for him as he has always been focused on his goals even at his darkest points so finding himself in limbo is something he struggles to deal with. Some of the self imposed torture doesn’t really make a lot of sense in the context of this particular struggle. 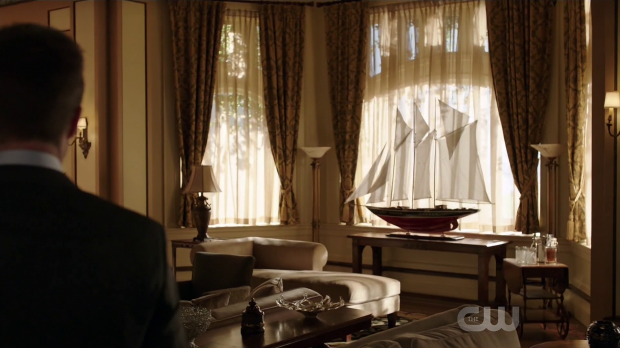 A mental trip into the Queen Mansion where he is confronted with a version of Laurel from before he left on the Queen’s Gambit and started down the path that would lead him here fails to provide answers. We can gather from this that he feels responsible for Laurel’s death because he didn’t do enough to either stop her becoming Black Canary or train her to be more effective in that role. Whatever his mistake he feels that her death is his fault and seeing this version of her is meant to remind him of the unspoiled version of Laurel who had such a bright future ahead of her. This is all well and good but has very little to do with his current struggle. He does feel guilty about what happened to Laurel but it has no real bearing on the abandonment issues that fuel the central conflict of this episode. The show also can’t really decide whether Oliver was right or wrong to encourage Laurel in that role. Laurel has been upheld as a symbol of the good that can be done behind a mask but has also been used as an example of a mistake that saw the death of someone in over her head. As such whenever Laurel is brought up to enhance a point it feels muddled because there’s no way she can be both. Similarly the mind trip to the hospital doesn’t have much bearing other than Oliver insisting that everyone abandoned him. Symbolically he sees this as his mistake and the hostility of the manifestations helps confirm the idea of his leadership style alienating those around him. Beyond that it serves no real purpose other than to remind Oliver of what has happened. The aim here is obvious. Oliver Queen is supposed to learn a bad lesson that leads him down entirely the wrong path for a while before he discovers that he was wrong to take that diversion and come back stronger than ever. This isn’t a bad idea and it’s handled really well though this is where the Adrian Chase manifestation is the wrong choice as it isn’t believable that Oliver Queen would listen to Adrian Chase under any circumstances. Tommy or Samantha would have been believable but Oliver should be more resistant to Adrian Chase telling him what it is he has to do. Outside of Oliver’s drug induced delusion his career as Mayor is falling apart. Firing the Police Captain and District Attorney is seen as an obstruction of justice motivated by his own interests. 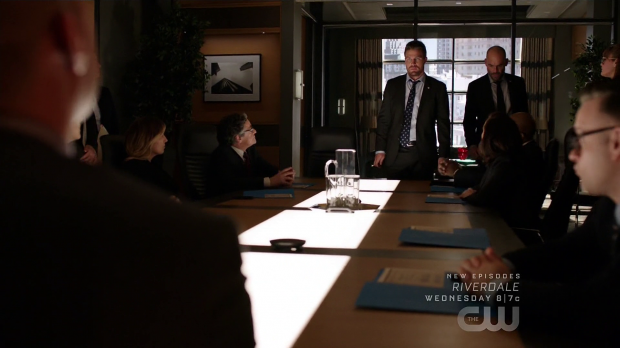 This angle along with Oliver’s behaviour means that impeaching him is an easy task which takes something else away from Oliver that he holds dear. It’s a literal deconstruction of the character in an effort to answer the question”Who is Oliver Queen?” by isolating him. This question had been hanging over the entire show since it began. It started with a man divorced from his own humanity and completely fixated on a singular mission that was a little misguided. As time went on he forged meaningful relationships, learned how to be compassionate and heroic while taking note of the bigger picture. The Hood/the Vigilante became the Arrow and that eventually became Green Arrow giving names to Oliver becoming a better person and marking clear signposts on his journey towards his humanity. What started as a solo crusade organically became a team that worked together to protect the city. Significant developments in Oliver as a character are signposted by things like name or costume changes which makes a lot of sense in a comic book inspired TV show. Names and visual identity are important in selling this deconstruction as Oliver comes to the decision that he has to return to the “Fundamentals” that give the episode its title. This means that he feels the need to go back to doing things like he did in the beginning which includes the old costume and a more hardened attitude to fighting crime. He is confronted by a manifestation of his season 1 self to match his current mindset and make him focus on betraying those simpler ideals rather than rising above them. It’s a perfect representation of how much he has changed as the two versions are clearly not the same person even though they are played by the same actor. As I’ve said he started completely alone without Diggle or Felicity to back him up and in order to weather this crisis he needs to go back to that because everything else diverts his focus in some way. To beat Ricardo Diaz he has to be laser focused on taking him down with no distractions. That doesn’t mean that he will be abandoning Felicity and William as they represent the separation of those two worlds. Felicity and William are his his home life only meaning he is able to compartmentalise the two sides of himself in order to focus his mission. My personal opinion is that Oliver is making a massive mistake as he is embracing his own loneliness and isolating himself from the support system that he still has which makes him more vulnerable in lots of ways. 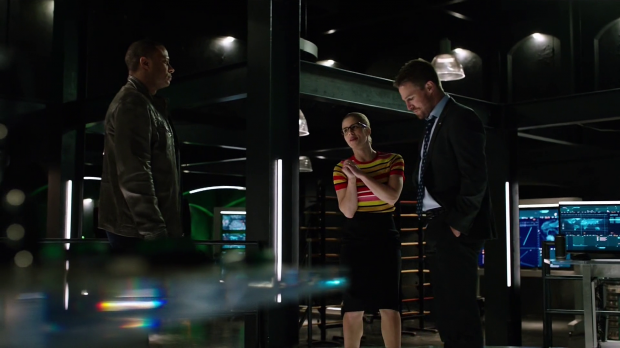 The most obvious is that Felicity isn’t there helping him out with tech support so he can only rely on his own spacial awareness when in combat situations. The fact that Felicity is the one who has to talk him out of running head first into a suicide mission is proof enough that Oliver needs help and for now he’s willing to listen. I suspect there will be scenarios in the coming episodes where failure could easily have been avoided if Oliver had some form of backup. The story itself isn’t a problem as exploring a character making the wrong decision and learning that he shouldn’t have made it is compelling so I’m interested to see where this goes. This episode is light on the other characters. 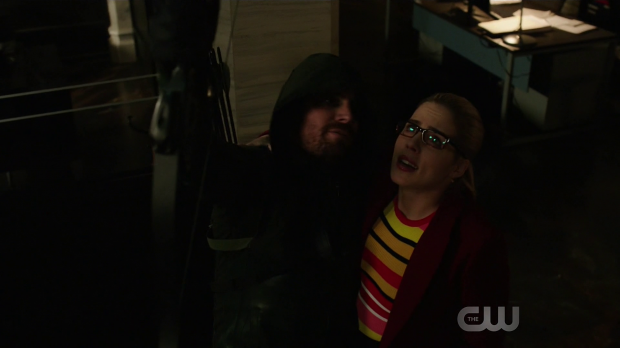 Felicity and William appear briefly in order to highlight how morbid Oliver is. Raising his voice to William out of frustration is the first sign that the Vertigo is kicking in though that isn’t known until later. It leads to Oliver hallucinating a version of Felicity who abandons him when in reality all she did was make sure that William was alright while giving Oliver time to cool down. 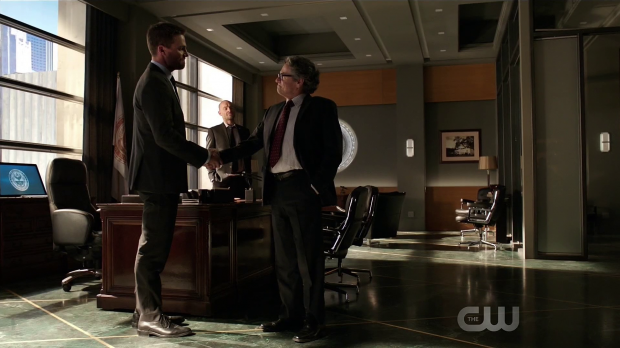 Quentin also shows up as the voice of support for Oliver when he is at his lowest point before he becomes Mayor after Oliver is removed from office. Diaz also appears briefly talking Green Arrow being better off alive as killing him would make him a martyr. The most striking thing about this is that it’s almost word for word what Oliver’s hallucination of Diaz says. I’m unsure if Oliver is just incredibly perceptive in general or if the hallucination was actually real somehow. Time may tell or it may be dismissed as a coincidence. Either way, Diaz is an effective villain because he doesn’t have that personal connection to Oliver but understands what’s important to him in life and looks to take that away. Felicity and William he seems content to leave alone for now but everything connected to the Green Arrow is fair game as far as he’s concerned. The episode has one major action sequence that is shown in the opening with the rest of the episode building up to it. It’s a really impressive sequence that makes use of a really cool tracking shot that follows Oliver’s movements. His combat style is more brutal than we often see to signify a return to a more season 1 like attitude. Wearing the old costume is also symbolic of that making all of the elements come together in a really interesting way. A strong character driven episode that isn’t without its flaws but addresses Oliver’s current predicament of feeling abandoned by those close to him. Using Vertigo to help him explore those feelings and find a way forward is a reasonable idea because it allows those issues to be directly addressed through hallucinations. The manifestation of Adrian Chase is perhaps the wrong choice when the aim is convincing Oliver what to do next as it isn’t all that believable that he would ever take advice given to him by Adrian Chase or something that looks like him. The episode is a great actor showcase with Amell carrying the emotional weight wonderfully even if some of the scenarios presented to Oliver don’t make a lot of sense. His desire to return to a more solo approach to crime fighting in order to bring down Diaz comes across as a flawed outlook which works as something for Oliver to work through and come back from. Being impeached as Mayor narrows his focus and deciding to cut Felicity out of his mission means that he can keep the two sides of his life distinct. 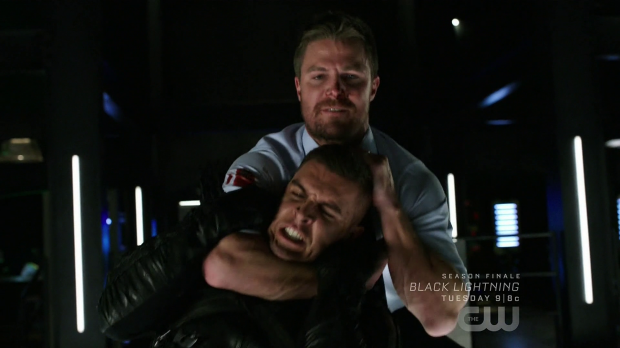 The episode also boasts an excellent action sequence when Oliver dons his season 1 costume and goes after Diaz with more brutality than we often see of him.